While 3D Digital HD TV is starting to get attention now in consumer market, Sanyo, the famous Japanese manufacturer has gone a step further by launching a new 3D Ready Ultra Short-Focus Projector targeted not only for educational purpose, but extended beyond entertainment and amusement segments. 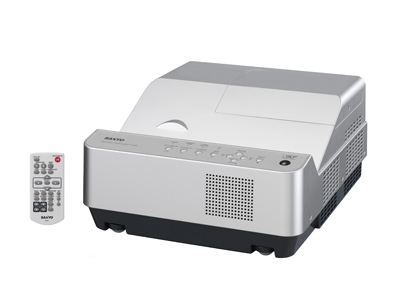 If you recall, Sanyo was the first that had came out with an ultra short-focus projector design that able to shorten the required space for large image to be projected on the wall. And on the subsequent year, the new series LP-XL150 was available which was dubbed as the world’s shortest focus range projector during that time. And now with the new series announced, it manages to shrink the space further with ability to project up to 80” image with shortest project distance of 32cm (previously was 45cm with LP-XL150) that will definitely able to extend its usability beyond current applications such as gaming, digital signage and many more. With such enhancement, it allows easy setup with projection in both vertical and horizontal ways, placement anywhere on the table, ceiling or even on the floor. And the major selling point here is, the new projector is 3D capable which utilizes Frame Sequential Display Format that rapidly alternates images sending between left and right eyes to enable 3D viewing with special active shutter format 3D glasses (sold separately). Other features include Wide XGA Real support, HDMI digital input, long-life filter for less maintenance, wired LAN RJ-45 port for easy control and management, presentation Timer, Direct Power-on/off functions and many more. Measured at 321 x 170 x 385mm, which is only half of the size of conventional model, the product will be available soon by July 2010. However, no pricing availability yet so stay tune for the update if you are looking to get yourself one in short future.